The European elections in May are our topic of the year 2019! We are talking about how to make voting accessible for people with intellectual disabilities and family members – and why it is important to vote! Every month we interview one of our “Voting champions”: People who are active in reclaiming the right to vote, who talk to politicians about voting accessibility and who encourage others to cast their ballot. Lucette and Dani Blanquart have been members of the delegation since its creation. The delegation created the “I vote” poster which explains how to vote and has already sold 700 copies to town halls and municipalities. You collaborated in the production of the poster on how to vote. Who had the idea to produce these posters? The idea came from our former support person Christine Heusele. We needed something simple to help us vote. She had seen a Tunisian election poster with drawings and thought it was a good idea. She suggested we adapt it to the French elections. How did you do to create the posters? We had been invited to a general meeting of a group of directors and secretaries of town halls. We talked about our difficulties with voting and our plans and they offered to help us financially. They did even more: they made the communication and a press kit and they took care of the copyright for the poster. They continue to this day to support us and to promote the poster. 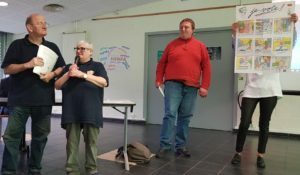 Lucette, you participated in a working group at the Paris City Hall to gather “good practices” in terms of voting awareness, with a dozen people including three self-advocates taking part. How did you like working in this group? We were well received and as we were few self-advocates, our opinion was important to them! They were very interested in the “I vote” poster. You also had to defend the poster. Why ? At one moment in the discussion they wanted to change some texts … for example to explain that you can invalidate your vote. But I was very clear: the work had been done. If everything needed to be changed now our work would no longer be useful. Now, people under guardianship in France will be able to vote thanks to an amendment of the law. What do you think about that? It is a positive change, but it will really need to be made known. Many people do not know they will be able to vote. 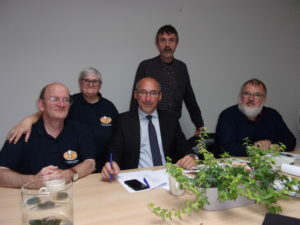 Members of “Nous aussi” also made a survey to find out how many people are registered on the election lists (in the “Institution or Services of Help Through Labor” – ESAT – where they work). What actions are planned based on the results? With the help of a trainee we surveyed ESAT workers. Many people are surprised when they are told that they can vote, they do not even know if they are registered or not on the electoral lists! On the other hand, when asked if they would be interested in getting help to register, they mostly are. We have a project to carry out mock elections to train people to vote, and to support our members to register. You participated in the Congress of Nous aussi on the right to vote. What did you learn during this congress? The experience of voting with a machine was very interesting, as well as the videos on the European elections. Why is it important for you to participate in the European elections? To vote is the duty of every citizen. It’s a way to express yourself. We are citizens like everyone else. Voting is important because it can help us make our dreams come true.